One arrives at Hanoi airport either in the morning or the afternoon, depending on the airline. It’s a half hour drive to the hotel in the center of the old town. We ride out of the bustling capital to the north. The first part is still busy with traffic, mostly trucks. Once on the narrow roads along the Red River, however, it is quiet and there is much to see. Nghia Lo is a nice little town where you will encounter Dao and Hmong people. We will spend the night here. In addition to the charming restaurant at our hotel there are also many other small restaurants and snack bars in the center where you can eat. We ride further north. The landscape is very beautiful here. On both sides of the roads, there are green rice terraces built against the mountainsides. We ride through the mountains here, crossing over a few high passes. There are more Dao people in this area. We stop for lunch in the town of Than Uyen, after which it is another 60 km ride to Sa Pa. This is the highest pass of this trip. The views en route to the famous Sa Pa Pass are fantastic; even the road has been improved recently. Sa Pa is the most touristy place we visit on this trip. As we do not come here at the weekend for the market, we do not see so many other tourists. Sa Pa is situated at an altitude of 1500 meters; during the French colonization it developed as a summer retreat to escape the oppressive heat in the lower parts of the country. We ride the first 110 kilometers of the day on a fully surfaced road. Along the way we stop in Lao Cai to take a look at the Chinese border. The Red River separates the two countries here and a railway bridge connects them again. Across the river one can see the tall buildings of the relatively-speaking much richer China. 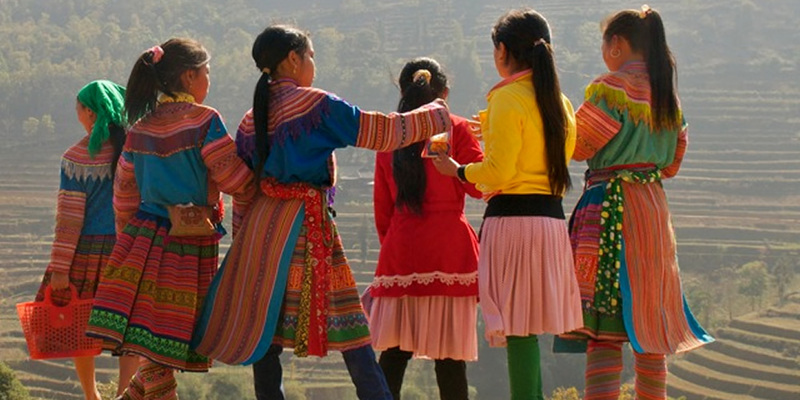 Bac Ha is a typical Northern Vietnamese village with vibrant peoples, located in a valley. 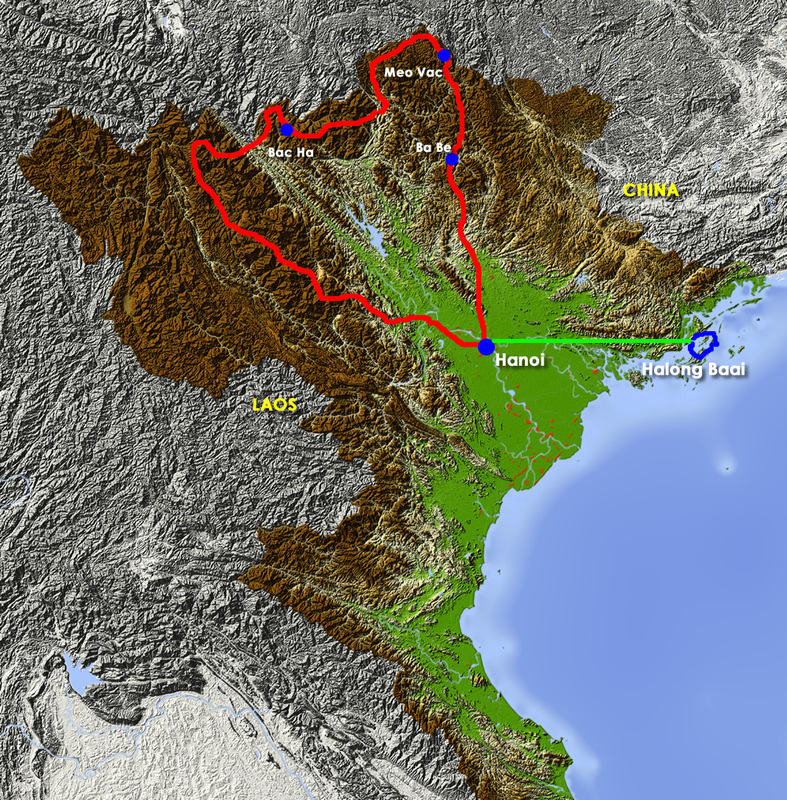 If we have time, we take the beautiful inland route via Coc Ly. We walk around Bac Ha in the morning. We will visit some H'mong villages in this area. Alternately, we can also explore the villages by motorcycle. At the end of the morning we leave for Xin Man. Just north of Bac Ha we turn right onto a dirt road. Tourists never use this route nor is the road suitable for big traffic. The rocky highland between the two places gives rise to a very special landscape. We ride through a spectacular region studded with jagged rocks. The small Hmong villages along the way do not see many passersby. After a beautiful descent we arrive in Xin Man. We stop here for lunch. Just outside of Xin Man we cross the bridge and turn right. We follow the river to the village of Huang Su Phi. There are many people of the Nung people here. Furthermore, there are many Nung villages en route. After a coffee break follows one of the most beautiful rice terrace regions of Vietnam. With each bend, there is yet another view of the beautiful green terraces. For the last section today, we follow the highway to the provincial capital of Ha Giang. One needs to watch out a bit in the busy traffic. We stay the night here in a resort on the river, just outside the center. After breakfast in the big city, we ride into an exceptionally beautiful mountain region. This is known locally as 'Dong Van - Meo Vac', after the two largest villages. 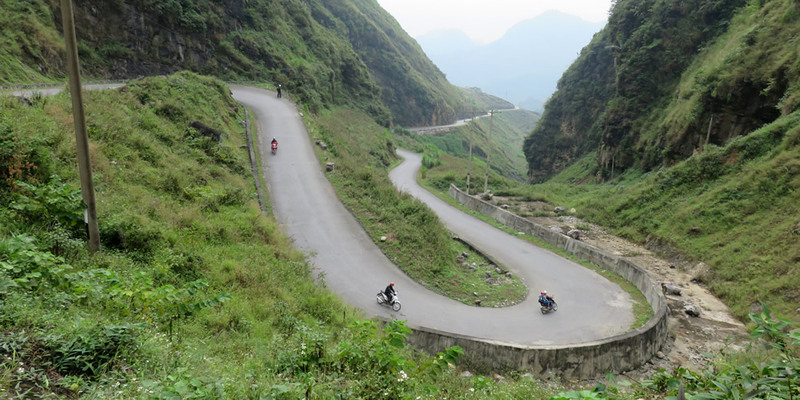 Immediately after Ha Giang, the road narrows and we climb over a beautiful ridge. The small town of Yenh Minh lies in the valley behind this ridge. In the Dong Van region, we become the show attraction for the local inhabitants. Foreigners are rare visitors for the tribes in this area. There are still real communist strongholds to be found in the remote areas of the province. Meo Vac is such a stronghold. All the stone buildings in the city are government buildings decorated with red banners. In order to reach Meo Vac, we first need to cross a few high passes. This is one of the most beautiful tours of the trip! Again here, we are not far off from the Chinese border. We stay overnight is a reasonably basic hotel. We rise early today in preparation for a long adventurous day. In the morning, we ride from Meo Vac to Bao Lac. This is a wonderful peaceful route through a rolling landscape covered with rice terraces. After lunch we ride along narrow inland roads to the Ba Be lakes which are to be found in the eponymous National Park. The lakes are surrounded by unusual jagged karst rocks We sleep here in a small village in a local person’s home. The conditions are very simple, sleeping with several people on the ground in a large room. This is a long day’s ride back to the capital. In the morning the roads are quiet but after Than Nguyen it gets busier. It is the last stage of the trip but perhaps the most special one. For many participants, riding into the city in the massive traffic is a fantastic end to the trip. If you have not booked the extension for Ha Long Bay, then you will leave early in the morning to go to Hanoi airport for the flight back home. Depending on the airline, you will arrive at Schiphol either on the same day or the next morning. You are collected from your hotel in the morning and taken by minibus to Halong Bay. This is a drive of about four hours. The pointy peaked mountains in Halong Bay make this bay very special. It is wonderful to sail across it on a boat. 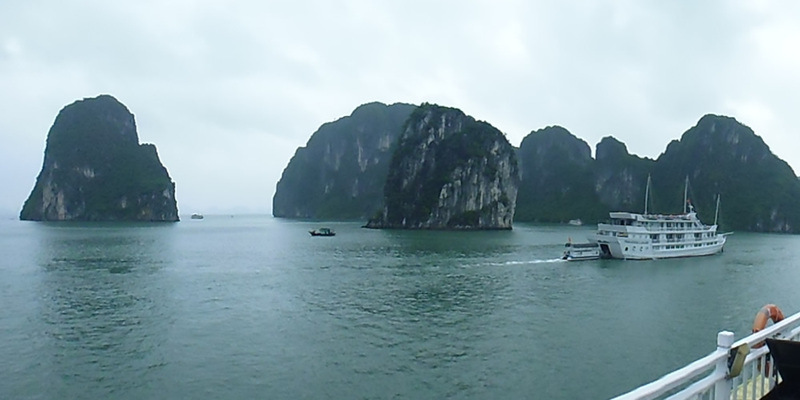 We arrive in Halong Bay around noon. You go onboard a traditional boat here, shared with other (international) visitors. We sail into the bay and spend the night on the boat in a beautiful location. If people are interested, we will make a stop at different caves. We come back ashore in the morning and get back into the minibus. There is much traffic between the coast and the capital Hanoi. The closer one comes to Hanoi, the worse it becomes. You can visit the old part of Hanoi in the afternoon. You can ride by motorcycle through the city or else get to know the old center on foot. Depending on your flight, you depart this evening for the airport or else in the morning. We leave by bus to go to the airport today.